Ethernet is the most popular Local Area Network architecture that was jointly developed by Digital Equipment Corporation, Intel Corporation and Xerox Corporation. It consists of certain specifications and standards as well as hardware devices and components. Ethernet provides services corresponding to physical layer and data link layer of the OSI reference model. Each Ethernet physical layer protocol has a three part name that summarizes its characteristics. The components specified in the naming convention correspond to LAN speed, signaling method, and physical media type. Ethernet 10 Mbps: A single LAN specification that operate at 10 Mbps over coaxial Ethernet 10base2 or 10base5 cable. 100-Mbps Ethernet: A single LAN specification, also known as Fast Ethernet that operates at 100 Mbps over UTP Ethernet cable. 1000-Mbps Ethernet: A single LAN specification, also known as Gigabit Ethernet that operates at 1 Gbps (1000 Mbps) over fiber optics and twisted pair Ethernet cables. 100BaseT uses the existing IEEE 802.3 CSMA/CD specification. As a result, 100BaseT retains the IEEE 802.3 frame format, size and error-detection mechanism. In addition, it supports all applications and networking software currently running on 802.3 networks. 100BaseT maintains dual speeds of 10 and 100 Mbps using 100BaseT Fast Link Pulses (FLPs). 100BaseT hubs must detect dual speeds much like Token Ring 4/16 hubs, but adapter cards can support 10Mbps, 100 Mbps, or both. Both signaling types are interoperable at the station and hub levels. MII ( Media Independent Interface) which same like AUI interface provides interoperability at base level. The hub provides interoperability at the hub level. The 100BaseX signaling scheme has a convergence sublayer that adapts the full duplex continuous signaling mechanism of the FDDI Physical Medium Dependent (PMD) layer to the half duplex, start-stop signaling of the Ethernet MAC sublayer. 100BaseTX’s use of the existing FDDI specification has allowed quick delivery of products to market. 100BaseX is the signaling scheme used in the 100BaseTX and the 100BaseFX media types. The 4T+ signaling scheme uses one pair of wires for collision detection and the other three pairs to transmit data. It also permits 100BaseT to work with existing Category 3 cabling while all four pairs are installed on desktop. 4T+ is the signaling scheme used in the 100BaseT4 media type, and it supports half duplex operation only. Medium Dependent Interface (MDI): The MDI is a mechanical and electrical interface between the transmission medium and the physical layer device. Physical Layer Device (PHY): the PHY provides either 10 or 100 Mbps operation and can be a set of integrated circuits (or a daughter board) on a Ethernet port, or an external device supplied with an MII cable that plugs into an MII port on a 100BaseT device (similar to a 10 Mbps Ethernet transceiver). Media Independent Interface (MII): It is used with a 100 Mbps external transceiver to attach a 100 Mbps Ethernet device to several of these three media types. The MII has a 40 pin plug and cable that stretches up to 0.5 meters. Ethernet is usually implemented a network interface card on a primary circuit board. 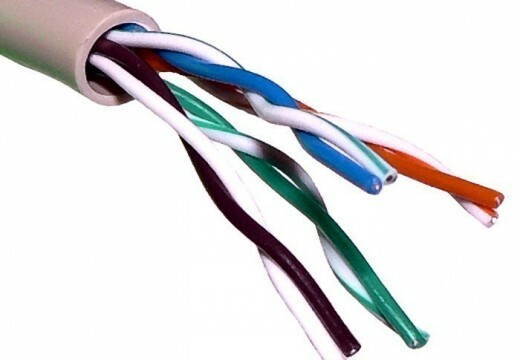 Ethernet cabling standards indicates that how to utilize a transceiver to connect a cable to the physical network medium. The transceiver performs a lot of of the physical layer functions, as well as collusion discovery. Transceiver cable is connected end stations to a transceiver. Ethernet provides for a verity of cabling options such as 10Base2, 10base5 and 10baseT. The 10base2 Ethernet connection is very rare nowadays because the 10base2 drivers are not so longer available while the 10base5 cable is referred as an AUI (Attachment Unit Interface) and the network attachment device is called a MAU (Media Attachment Unit), instead of a transceiver. 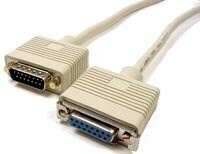 The AUI connector is connecting with AUI to AUI cable. 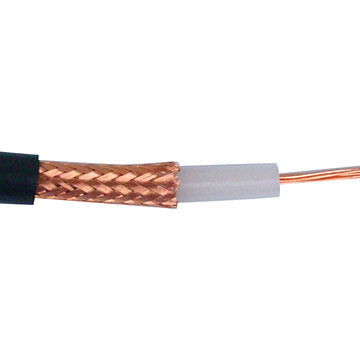 The AUI to AUI interface cable can be connected with the switch AUI port with the help of AUI and transceiver. The Gigabit Ethernet specification addresses three forms of transmission media: long-wave (LW) laser over single-mode and multimode fiber (to be known as1000Base LX), sort-wave (SW) laser over multimode fiber (to be known as 1000BaseSX), and the 1000BaseCX medium, which allows for transmission over balanced shielded 150 ohm copper cable. The IEEE 802.3ab committee is examining the use of UTP cable for Gigabit Ethernet transmission (1000BaseT). The 1000BaseT draft specification would be used to enable Gigabit Ethernet to extend distances up to 100 meters for category 5 UTP cable which is widely used for cabling in buildings. The Fibre Channel PMD specification currently allows for 1.062 gigabit signaling in full duplex, Gigabit Ethernet will increase this signaling rate to 1.25 Gbps. The 8B/10B encoding allows a data transmission rate of 1000 Mbps.Existing type of connector for Fibre Channel and for Gigabit Ethernet is SC connector for both single and multimode fibre. The Gigabit Ethernet specification calls for media support for multimode fiber-optic cable, single-mode fiber-optic cable, and a special balanced shielded 150 0hm copper cable. 238 queries in 0.492 seconds.